Rhodes. Probably not your first thought when it comes to the Greek Islands. Although it is a very popular tourist destination, when I think of the Greek Islands, I think of the big two… Mykonos and Santorini. But Rhodes took me by surprise, and somehow managed to take the cake over the others! When I got off the boat at Rhodes, I immediately felt relaxed and like “This is a holiday”. 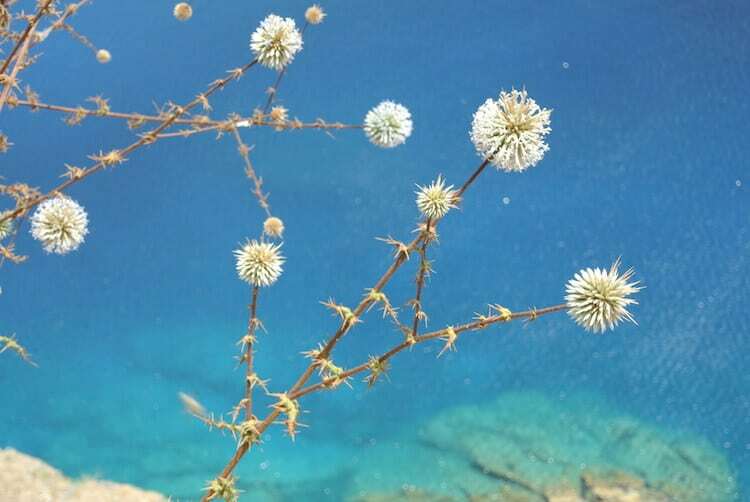 I was happy to see that the Greek Islands and Greek People were exactly what I had hoped. Passionate and loud conversations, crazy drivers stopping where they shouldn’t and not stopping where they should, and friendly communities. We were lucky enough to stay with one of Chris’ family friends, and I’ll never forget the night we were walking home, up cobblestone moonlit streets, to the sound of someone playing the guitar. As we got closer it was the family friend, sitting on a bench in the street, playing his life story to passers by. 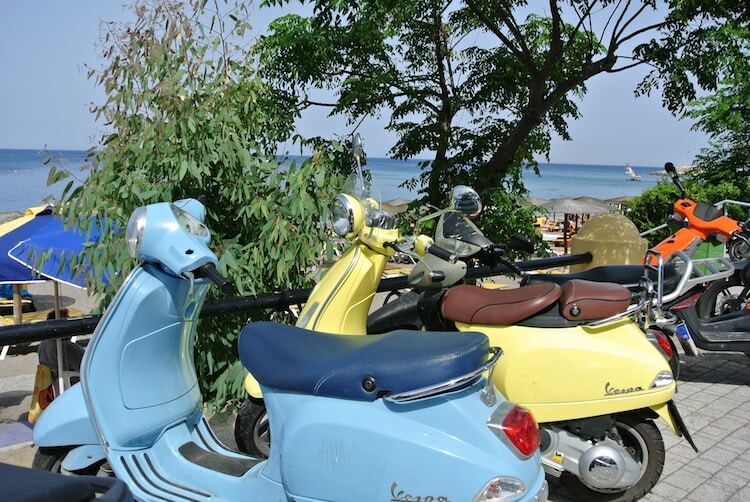 There is an overly friendly rawness to the Greek Island culture, a strong sense of community and belonging. It’s infectious. Although it is a popular tourist spot, you also feel like you’re staying amongst the locals too. It’s nice to feel like the place you’re visiting is lived in rather then just visited. Even in the old town, there were locals homes mixed in with the shops and hordes of tourists. White sand. Clear Blue water. Sun. But that wasn’t the best bit. There was a beach within reach of almost everywhere. We stayed in the old town, but if you walk outside the gates, there are some beautiful spots to swim or relax. In the new town, there were bigger beaches with umbrellas and more people. And then there is Lindos. 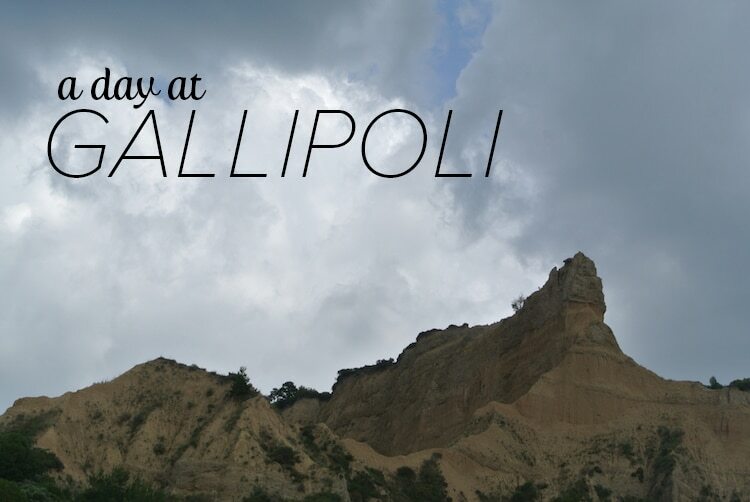 Not only a stunning beach, but a maze like village featuring the acropolis of Lindos. 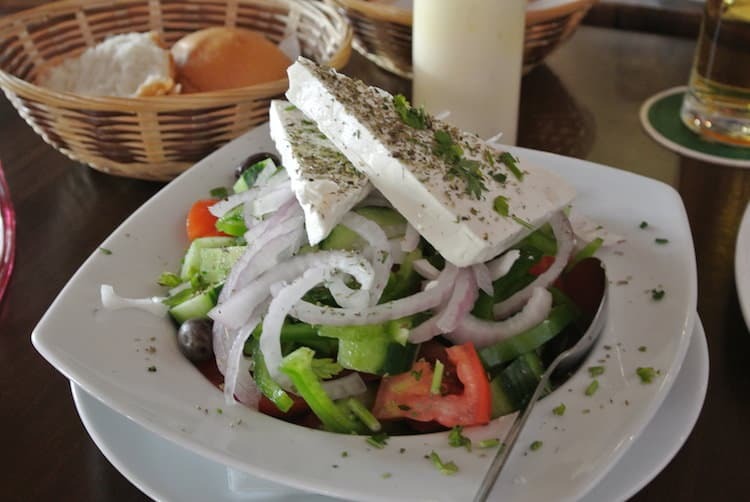 Rhodes was the first place I visited in Greece, so it was also my Greek Food Introduction. I love how a real greek salad comes with an entire block of fetta on top, how they put chips in there Gyros, the healthy breakfast spread, the moussaka, tzatziki, the fresh fish, flavoursome meat dishes and don’t even get me started on the Greek mezze. Greek food was a definite highlight for me! 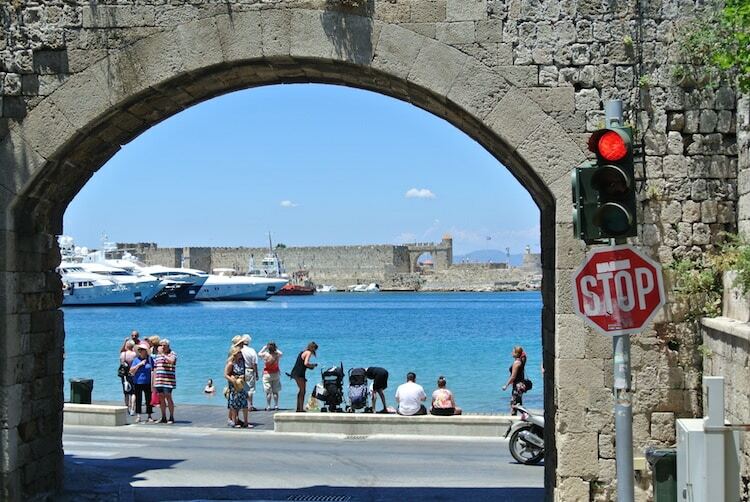 History is everywhere in Rhodes. Whether it is the stories, the sights, the old town or even in the language. My sister had a baby about a month before we left for our trip, and called her Sofia. We did a historical walking tour and the guide was saying how Sofia means wisdom and is from the word “Philosophy” which in Ancient Greek was “Philosofia”. It’s just really fascinating seeing how things we say or do today are derived from the past. Want To Go To Rhodes? Stay in the old town. Being able to wake up in such a historical centre is great! You can easily spend your days exploring the old town, and you will be close to most things. Try the food. 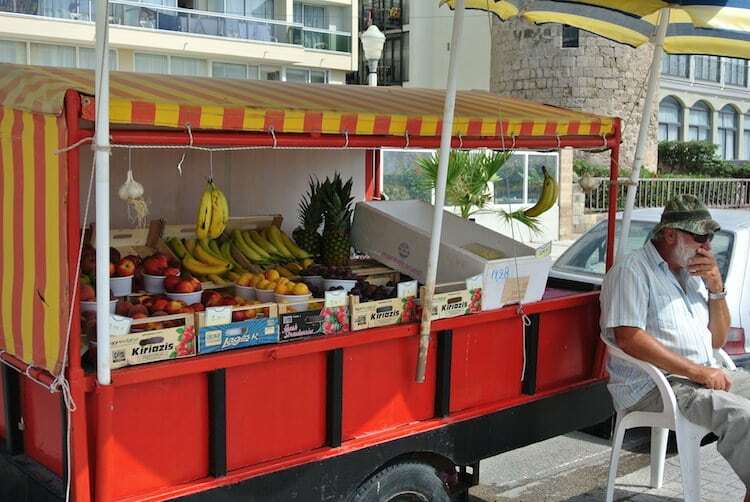 I loved Greek food and the fresh produce was fantastic. 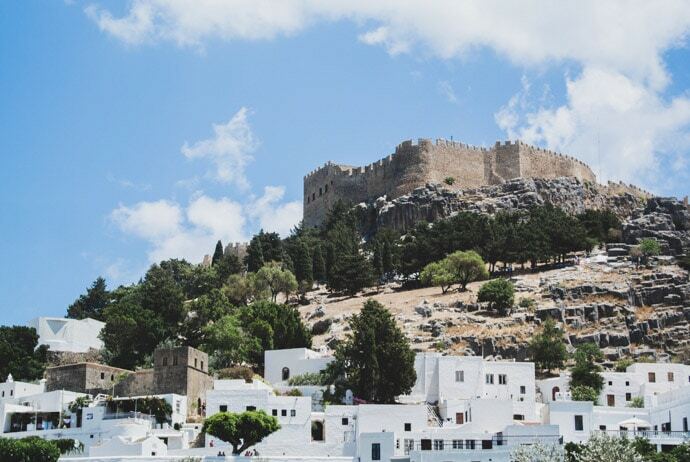 Visit Lindos and Walk up the hill to the Acropolis…even if just for the views! Make time for the many beaches. 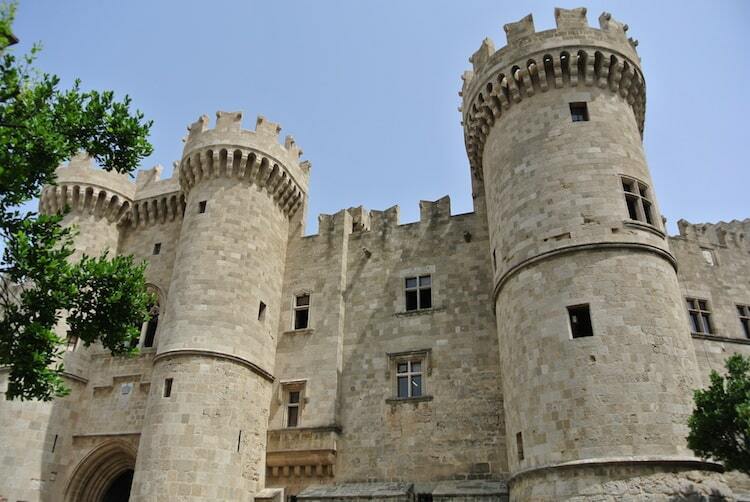 So Rhodes had it all, history, food, sights, beaches, culture, friendliness and relaxation. We spent 5 days in Rhodes and every day I found something new to love. It has a way of making you wake up feeling refreshed and go to bed feeling happy. Thanks Rhodes for some wonderful memories, and hope to see you again soon! So Why Was I Surprised I loved Rhodes? 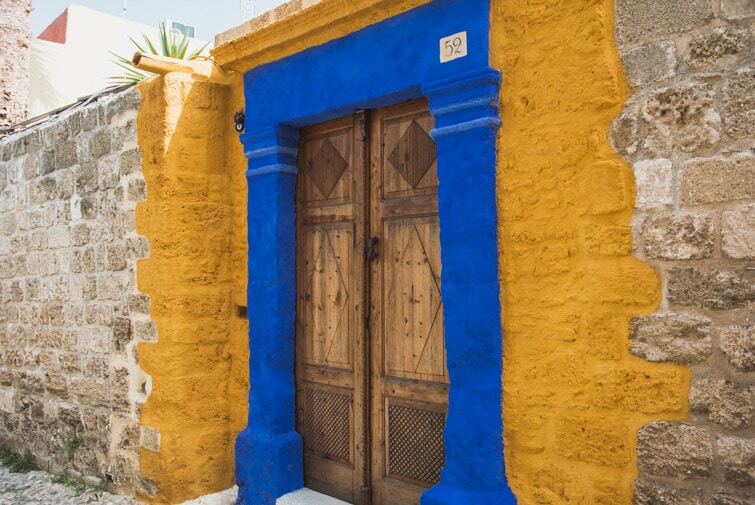 Pictures of Santorini are lathered all over the Greek Travel Brochures, for it’s stunning villages and views. Mykonos is famous for its picture perfect beaches, high profile visitors and lively nightlife. And Rhodes, I, unfortunately, hadn’t heard much off. Because sometimes it’s nice to come across something unexpectedly fabulous.